A little girl, about three years old, is the only passenger on a miniature merry-go-round. The tiny horses are delicately painted. A tattered “Pilsen” beer umbrella is used to shade them, instead of the usual over-decorated roof that merry-go-rounds often have. I point out to my friend a large beer bottle sitting underneath, near the old man operating the ride. A few feet away three men are smoking against a railing in front of their Yamaha motorcycles. Their hats sit high up on their foreheads. One guy is wearing a rosary. We sit on the ledge near the men to take in an almost panoramic view of the city. It’s Medellín, Colombia, a place that was long known as the most dangerous city in the world. Medellín, Colombia, is a place that was long known as the most dangerous city in the world. It suffered a death rate of 380 per 100,000 people in 1991—6,349 murders in a single year. Once home to notorious drug lord Pablo Escobar and his violent drug cartel, the city saw a death rate of 380 per 100,000 people in 1991. In Colombia’s second largest city, that was 6,349 murders in a single year. Now, the violent death rate is down by 80 per cent, a fact that flaunting city officials say could be part due to urban planning initiatives. To the right of my friend and me is one of the initiatives: Biblioteca España, a $4 million library in the neighbourhood Santo Domingo, a place where even in 2003, it was illegal to be out on the streets after 5 p.m. The modern library is impossible to ignore as it towers over the houses perched on the steep hills in the impoverished Medellín neighbourhood. Completed in 2007, it consists of three non-symmetrical black buildings that resemble rocks. It’s accessible by the modern Metrocable, an extension to Medellín’s metro that opened in 2004, and has since grown to be 9.5 km long. It connects poor northern neighbourhoods, like Santo Domingo, to the richer south. The library is filled with books, yes, but also focuses on offering community services. There are just a few small windows looking outside. The architect, Colombian Giancarlo Mazzanti, wanted Santo Domingo residents to forget about the stark neighbourhood surroundings while inside the library. The city has since become revitalized, with the violent death rate down by over 80 per cent. City officials say this could be part due to urban planning initiatives, such as the Metrocable, which was designed to reach some of the least developed areas in the city. Before Pablo Escobar was killed on a Medellín rooftop in 1993, violent urban militias controlled the area. RCN Colombia News reports that the drug lord offered 1 million Colombian Pesos, now $500 Canadian, to residents of the neighbourhood to kill one police officer. Rosalba Cardona, a human rights organizer who challenged the paramilitaries that controlled the neighbourhood after Escobar, escaped when her fellow organizers were killed. Her husband and son also died in the violence. “You cannot imagine this barrio even 10 years ago. They were offering money to little kids to kill the police. It was desolate and dangerous, they were even putting bodies in the church,” she told The Guardian in June 2013. 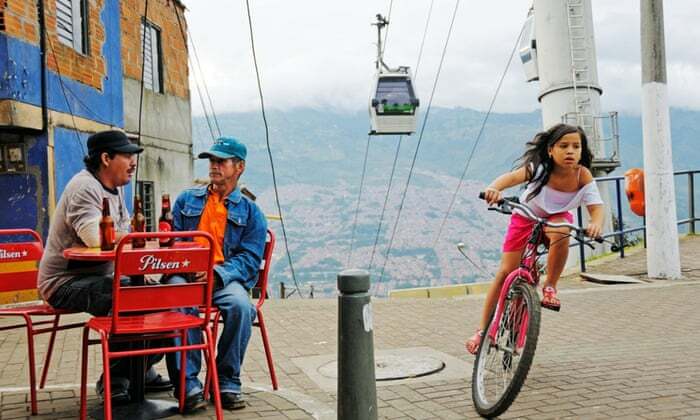 In the mid-1990s, a small group of people in the department of social civic planning at the Medellín Academy began to think of ways to improve the city, says Alejandro Echeverri in the Guardian. He works for the city to help implement change. In one of the poorest slums, city planners installed an enormous 384-metre long escalator that prevents residents from trudging up a staircase, which was the equivalent of a 28-storey building. It reduced a 35-minute uphill hike to just 6 minutes, improving their daily quality of life. When Sergio Fajardo became mayor of the city in 2004, he devised a plan to promote peace through urban planning. And thus, Biblioteca España, and now 10 more library parks, were born. The building of the library and Metrocable in Santo Domingo has attracted tourists to the otherwise off limits neighbourhood, but Medellín, and Colombia too, is still riddled with violence. Fronteras Invisibles, invisible lines that divide gang territories, exist. In Comuna 13, another area accessible by the Metrocable in Medellín, three boys who were delivering food crossed into gang territory. The eight-year-old was sent away, but two 11-year-olds were tortured and dismembered, The Guardian reports. This was in 2013. 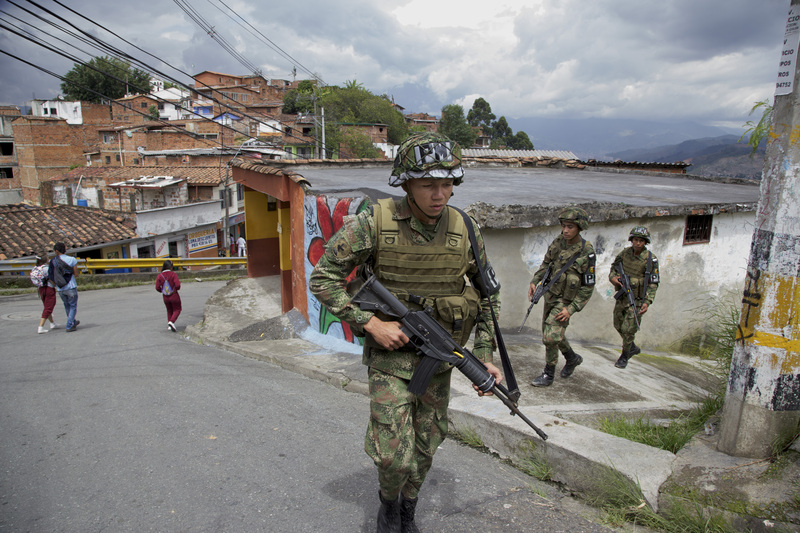 A 2012 UN report said Colombia had the 10th highest homicide rate in the world. But still, on a long weekend Sunday, kids jump up and down on two trampolines under the Metrocable, a bounce castle shaped as a tiger jiggles, and kids circle past us on bicycles. As we’re walking down the ramp to the library, we stop and watch three smiling and screaming boys kick around a soccer ball just outside. Using urban planning as a weapon, Mayor Sergio Fajardo has built 5 library parks, 20 schools, and 124 high-rise buildings, giving a new face to a city once ravaged by violence, drugs and corruption.